How Fast Does a Bearded Dragon Grow? While adult bearded dragons are large enough to repel many predators, young ones are bite-size snacks for a wide variety of predators. Because of this, bearded dragons grow very quickly, and are capable of reaching adulthood in less than a year. Do not be frustrated if your bearded dragon takes longer than this to mature; by providing top-notch husbandry you can accelerate their growth rate. Bearded dragons (Pogona vitticeps) are omnivorous lizards hailing from central and eastern Australia. They derive their colloquial name from the dark scales on the throats of adults. When threatened by a predator, bearded dragons will puff this dark throat out and gape to make themselves look larger and more intimidating. Bearded dragons are semi-arboreal omnivores that consume a variety of insects and small vertebrates as well as fruits, flowers and vegetation. Usually reaching about 18 to 22 inches in length, they are perfectly suited for captivity; they grow large enough to allow moderate interaction, yet not so large that they are difficult to house. Bearded dragons are approximately 3 to 4 inches in total length when they hatch. When provided with optimal husbandry, they will double this length by the time they reach 6 or 7 weeks of age. By 3 months of age they may approach 1 foot in length, and by 6 months of age, well-fed bearded dragons will be approximately 16 inches, and nearing sexual maturity. However, most hobbyists are not capable of providing this level of care; accordingly, pet bearded dragons may take twice as long to reach sizes comparable to those that professional breeders achieve. Attaining maximum growth from your bearded dragon requires top-notch husbandry and ample food. Be sure that your bearded dragon has access to suitably warm temperatures, and that the cage is well lit; bearded dragons lose their appetite in cool, dim conditions. Additionally, keep the cage as clean as possible to reduce the chances of your lizard developing high parasite loads. Feed your dragon well, providing a variety of fruits, vegetables and insects. 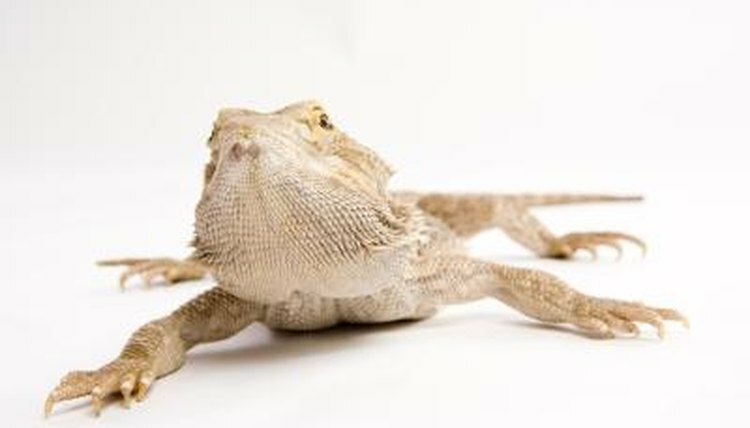 Growing bearded dragons should derive about two-thirds of their calories from insects and one-third from vegetation; mature dragons require the opposite ratio. Different bearded dragon lineages reach different sizes. Bearded dragons from the “German giant” bloodline sometimes reach 2 feet in length, and can weigh much more than typical bearded dragons. Additionally, bearded dragons are sexually dimorphic—males usually reach larger sizes than females. Further, bearded dragons are individuals, with different genetic potentials; just as with humans, some will be larger than others.